I home school my three children and am always searching for superior supplemental learning tools. I recently discovered the Rock N Learn Phonics DVD learning system and we really liked it. 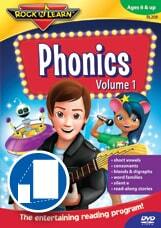 My eldest son is in kindergarten and I reviewed Rock N Learn Phonics Volumes 1 and 2 with him. Even my daughter, who is almost 4 sat next to us and tried to repeat the words throughout the video too. What impressed me the most is that my son appeared more confident and began to sound out words of common items around our house in the hour after watching Rock N Learn. I also appreciated that the DVD allowed for him to practice phonics instruction independently. The Rock N Learn Phonics series was designed to help young readers learn the rules of phonics and how to pronounce basic words and simple sentences. The vivid animation and catchy rhymes grabbed my children’s attention. Even though it is developed for children ages 6 and older, my son, age 5 watched the entire video (approximately 78 minutes) and my soon to be 4 year old was captivated for almost 45 minutes (an eternity for her). The read along stories and fun songs was also entertaining while educational. I was surprised to find out how many Rock N Learn Subject are in the series including Science, Math, Social Studies and more. My son can’t wait to see if Santa brings a “Human Body” DVD under the Christmas tree this year. I was thrilled that my son is asking for learning tools instead of the usual toys. To purchase Rock N Learn Phonics or to find the Rock N Learn DVD that would delight your young learner check out http://www.rocknlearn.com/index.htm. This post was written for Family Review Network & Rock ‘N Learn who provided the complimentary product for review and giveaway in exchange for my honest review. Alphabet Exercise is the one I like best. I like the alphabet exercise dvd. Thanks for the chance. The Getting Ready for Kindergarten DVD would be great for my little girl! I like the Getting Ready for Kindergarten DVD. I like the telling time dvd. I like the Colors, Shapes & Counting DVD, thanks. Finally Followed on Network Blogs!